This styling chair can be customized with a two tone color combination as shown. Designed for clients of all sizes. The T-Bar footrest adds to its modern style. Made in America and designed with client comfort and durability in mind. 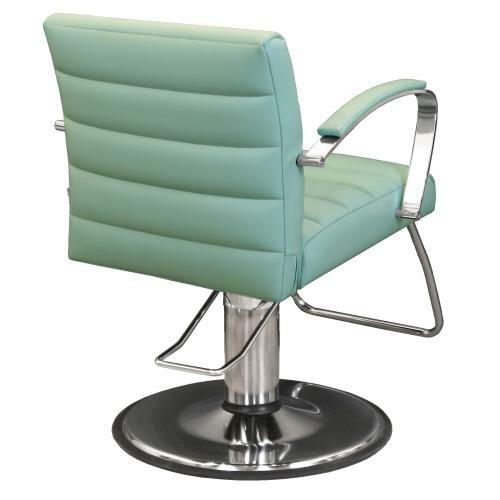 The Pibbs 3406 Cosmo Styling Chair will give your salon a modern touch. 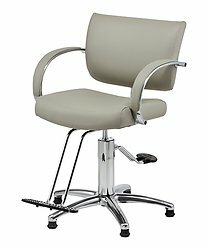 It features a luxuriously cushioned extra-wide seat, heavy-duty hydraulic pump for adjustment of clients and two durable footrest options. The T-Bar footrest adds to its modern style. 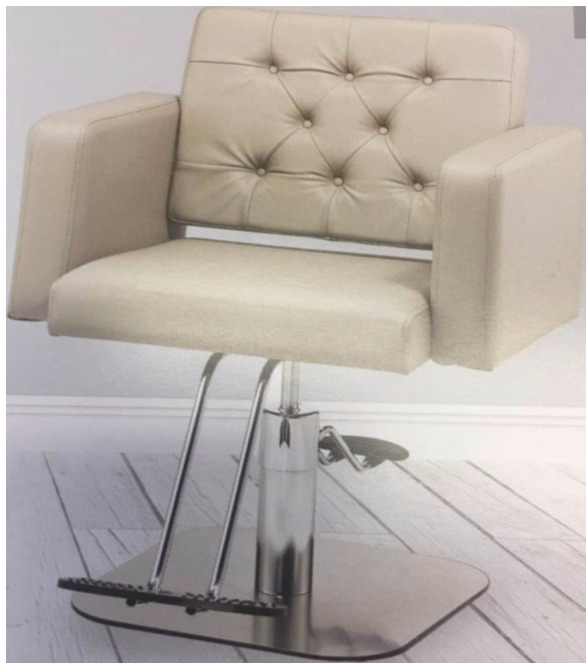 The Pibbs 2206 Fondi Styling Chair takes luxury to the next level! It provides an elegant, classic touch to any business. ? It is designed with client comfort, durability, and world-class style in mind. It provides an elegant, classic touch to any business. It is designed with your client's comfort in mind! 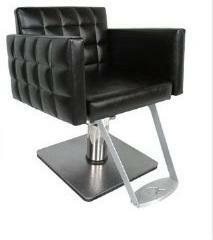 With durability and style it will be a great addition your salon or barber shop. 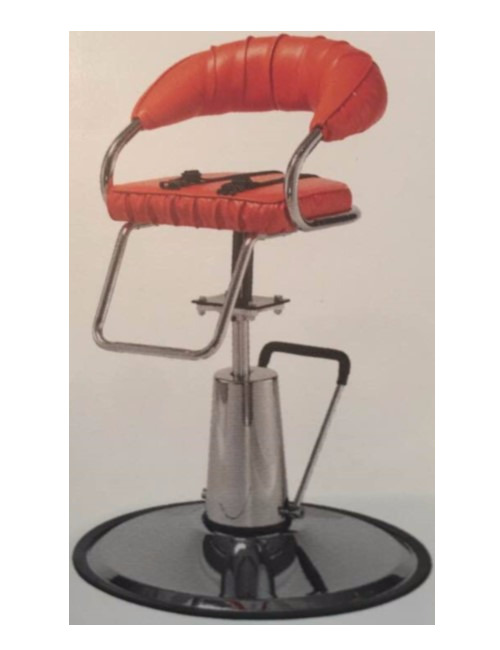 This is a high quality salon chair that is built to last many years and comes with a 3 year warranty on the hydraulic pump. 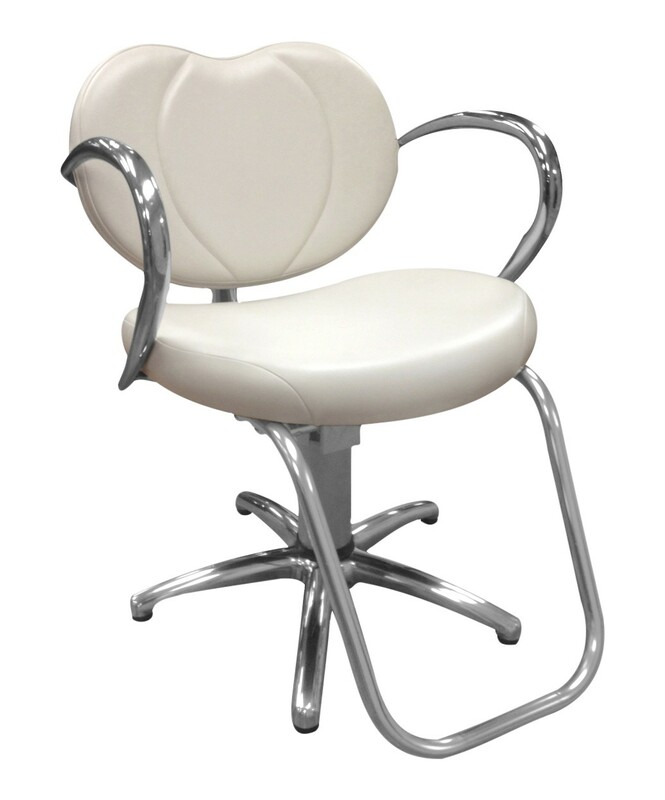 Made with sleek chrome arms that give the chair and your salon a modern look and feel. This is a high-quality styling chair that is very stylish at an affordable price! Available in different colors. 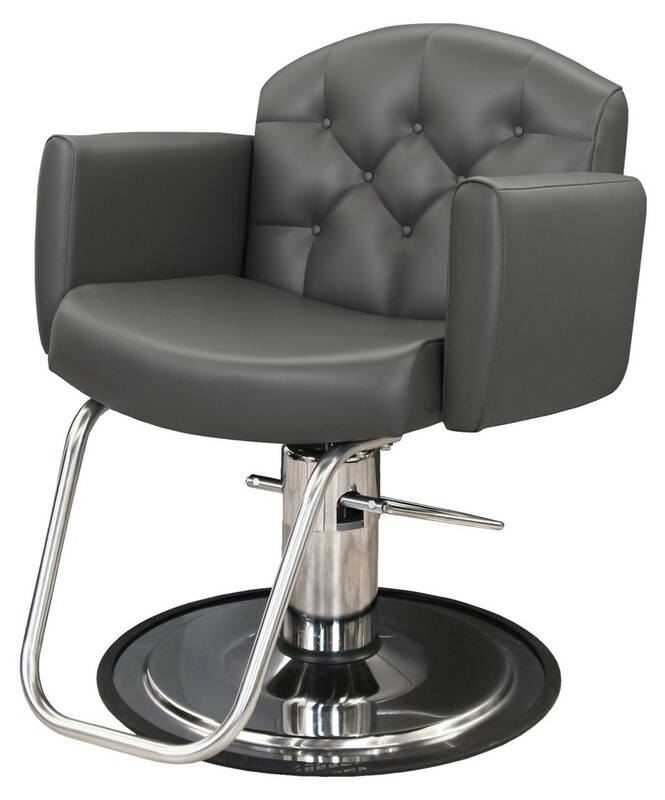 The Bari Styling Chair is designed with durability, client comfort and world-class style in mind, while adding a chic, modern touch to any salon.? 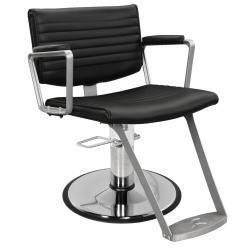 The Pibbs 4506 Bari styling chair features a cushioned extra-wide seat, a modern low-cut back cushion, a heavy-duty hydraulic pump, two durable footrest options. 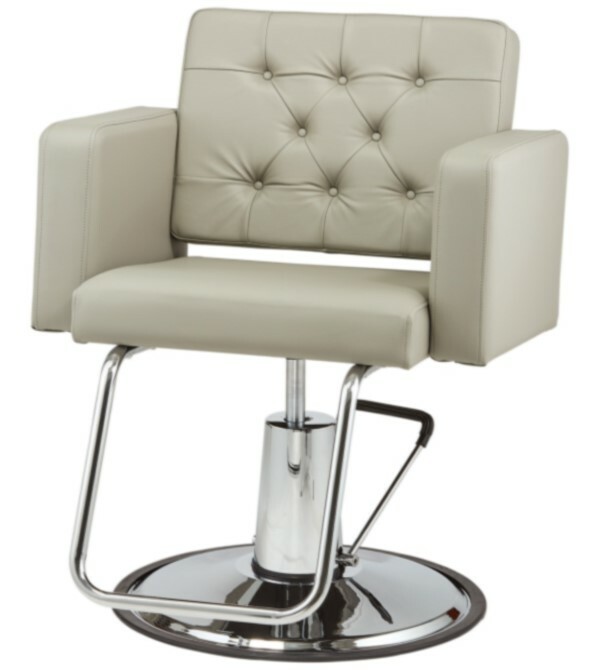 A great addition to any salon with upholstered cushions and wide seat depth. 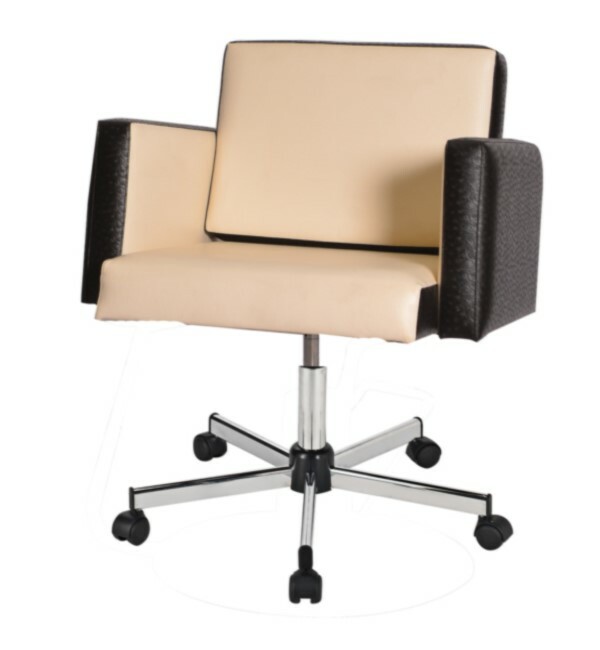 This chair is designed for client comfort with sturdy hydraulic round base and footrest. Made with black molded urethane arms, this chair has extra wide seat for your larger customers while keeping it's style and affordability. 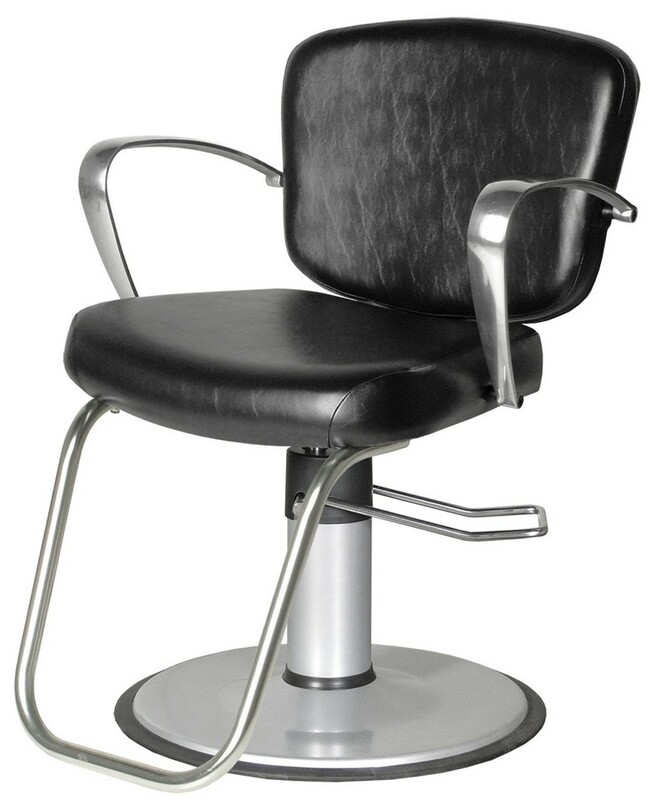 Pibbs 4346 is a high-quality styling chair that is great looking at an affordable price. It's built to last with a 3 year warranty on the hjydraulic pump. The Pibbs 5407 Loop Chair is made with metal arms covered with high density black plastic that gives the chair a classic look and feel.? 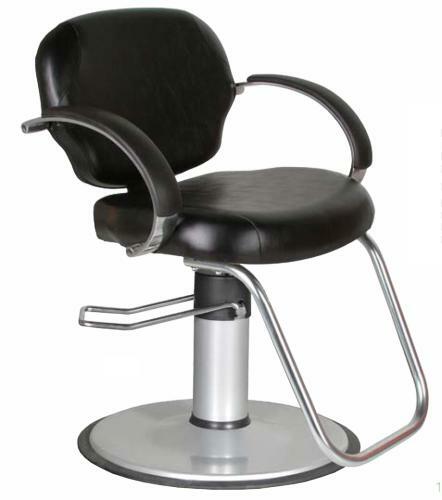 The Pibbs 3506 is a high-quality styling chair that is great looking at an affordable price! Available in different colors. Made with black molded urethane arms, this chair has extra wide seat for your larger customers while keeping its style and affordability. 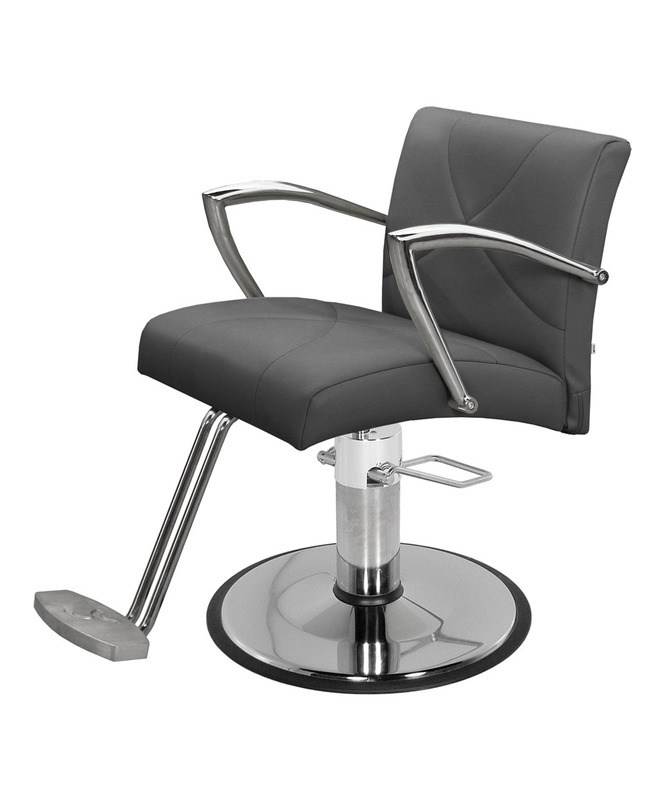 This styling chair by Pibbs is made with chrome arms that give the chair a modern and stylish accent. It also has an extra-wide seat that will fit all of your larger customers. 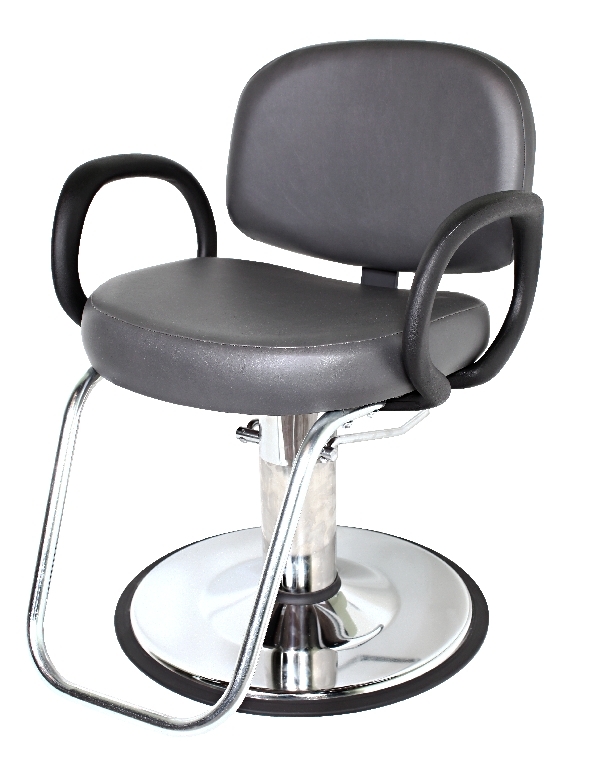 This high quality salon chair comes with a 3 year warranty on the hydraulic pump. It has matching upholstered arms for stylish accent. . 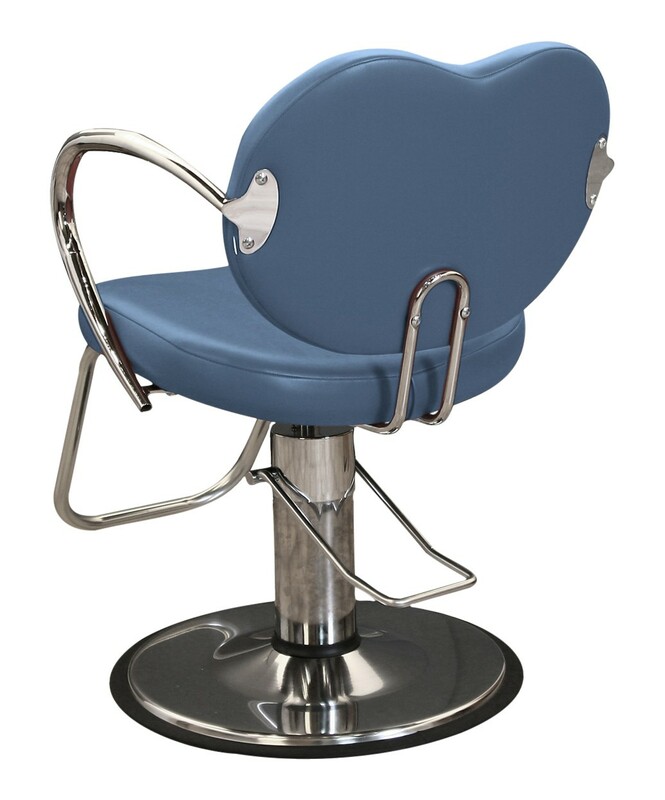 This styling chair features a plush, scalloped chair back design and chrome frame. It has an extra-wide seat making it very comfortable for all of your customers. 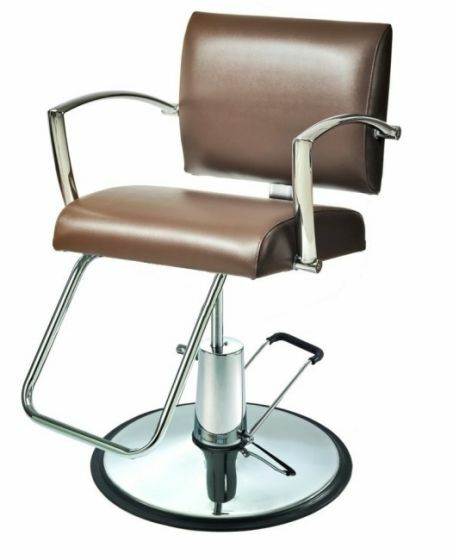 High-quality craftsmanship with a modern design makes the Pibbs 3906 Latina Salon Styling Chair the perfect fit for just about any hair salon.? This high quality chair has wood arms on this chair give it a timeless look that is perfect for any salon! 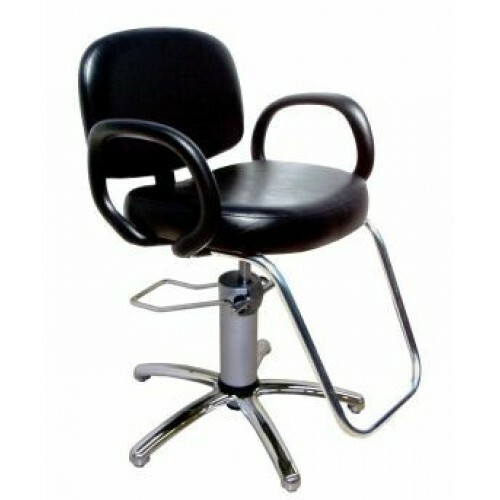 This chair is manufactured by Pibbs Industries guaranteeing the utmost craftsmanship found in the salon equipment industry. 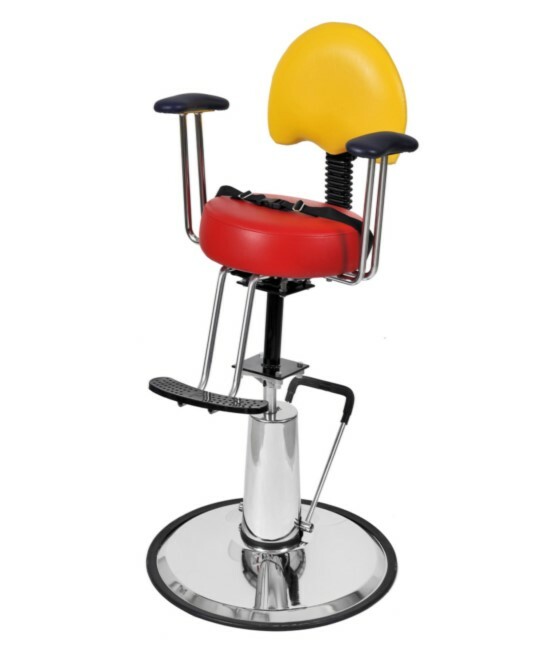 The Pibbs Topolino hydraulic kids styling chair features an upholstered seat, back and arms. With a platform style footrest and safety seat strap included. 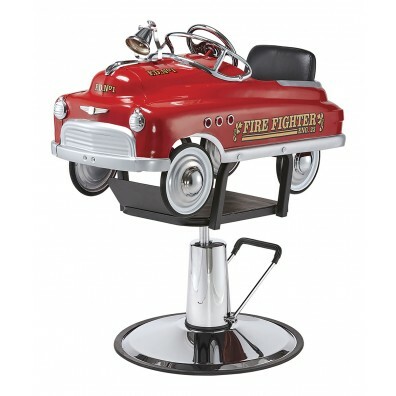 This Fire Truck-style children?s salon chair includes a steering wheel. It also features a full metal frame giving it far more durability than its plastic counterparts. This chair has a padded upholstered seat that guarantees the utmost comfort for the little one who walks into your salon. They will love this tyling chair, designed to look like a classic NY City Taxi.? 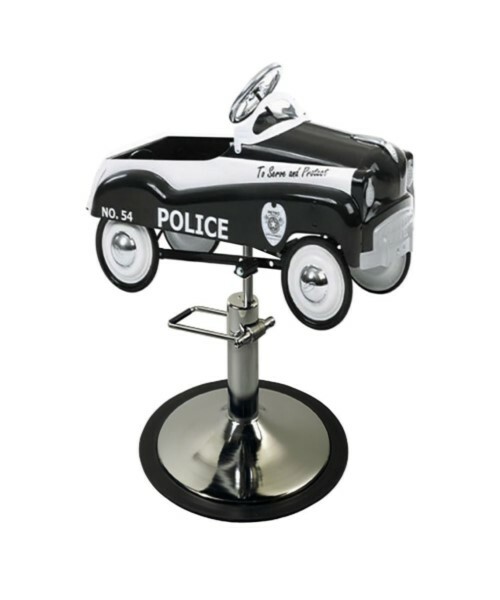 This styling chair is designed to look like an old-fashioned police car and includes an upholstered seat cushion. ? 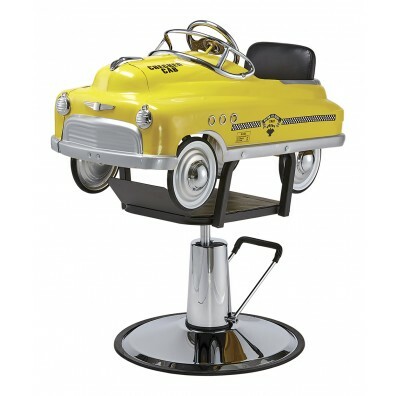 This styling chair is designed to make your little enjoy their experience at the salon. Very comfortable for the little one who walks into your salon. 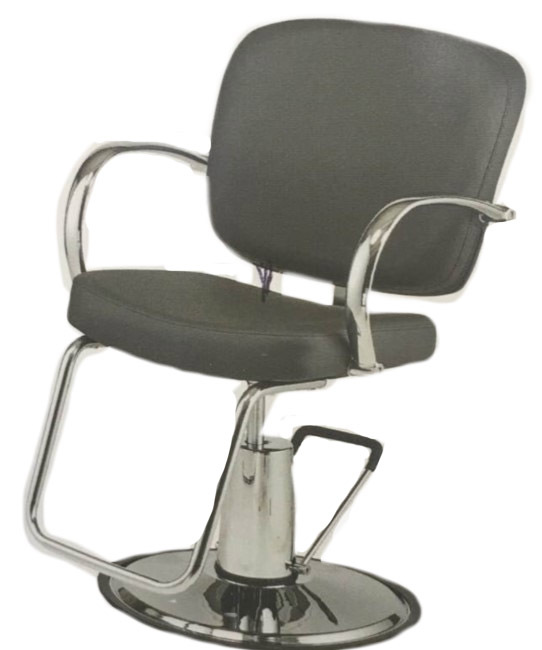 The Loop 5470 styling chair is manufacature by Pibbs Industries guaranteeing the utmost craftsmanship found in the salon industry. The Cigno chair is the perfect combination of European styling, art deco and retro design. It has heavily padded seat, back and arm cushions. This chair is beautiful and comfortable. It can be ordered with two-tone upholstery by special request. Available in vinyl uphostery colors. The Metro stylingr chair is stylish and versatile! It has a thick 4 inches seat cushion and a wide 22 inches between the arms, rubber tread footrest and fixed-position back. It is a comfortable chair for your clients. It has rubber tread footrest. Available in upholstery colors. 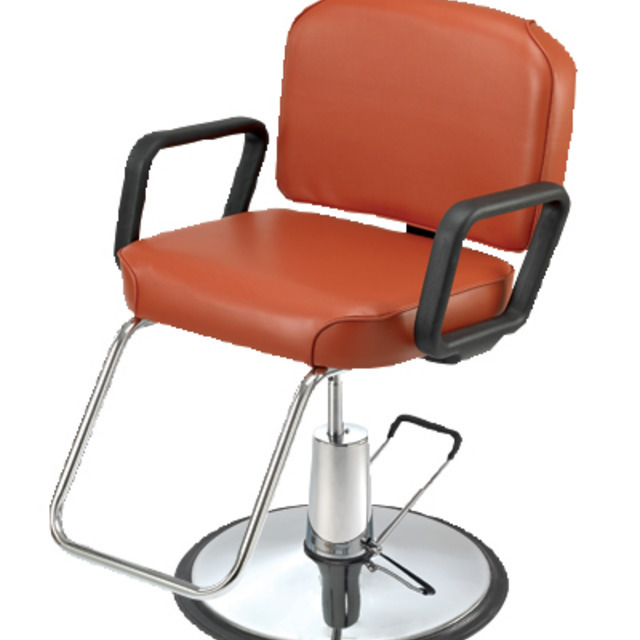 This chair offers the highest level of quality and durability that you can find in the salon equipment industry. It features a heavy-duty base, tubular steel platform footrest with rubber tread, twin calf bars in footrest, custom quilted upholstered arm rests and stationary back. Available in upholstery colors. The Hackney chair features a heavy duty base, custom quilted upholstery, padded arms, steel footrest with rubber tread and stationary back. 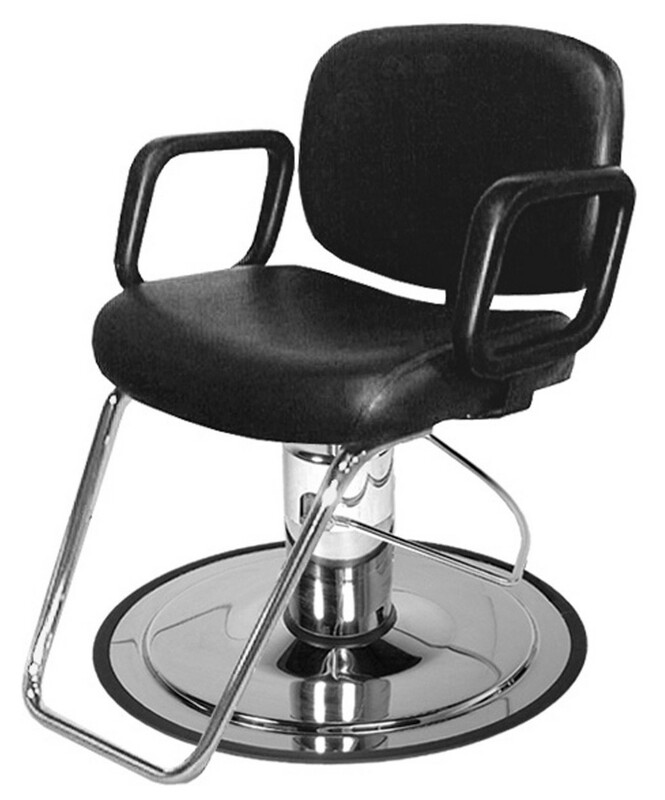 This is a heavy-duty styling chair with great performance for many years! Available in upholstery colors. 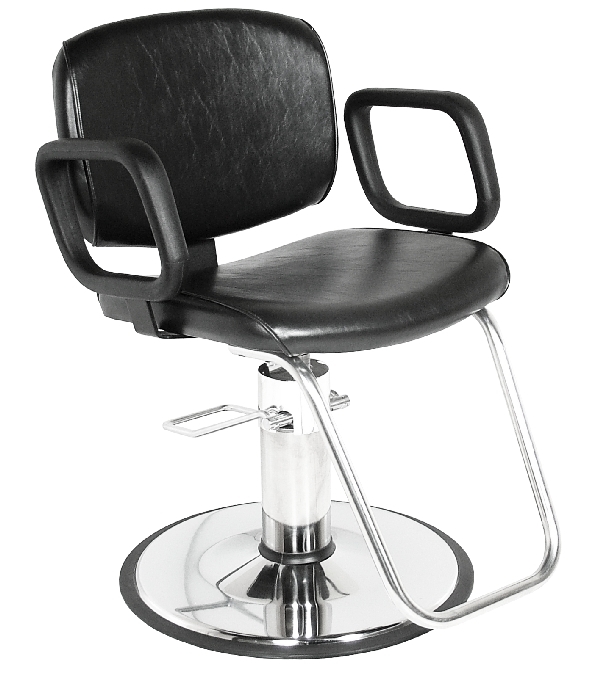 The 6700 styling chair offers the highest level, quality and durability that you can find. 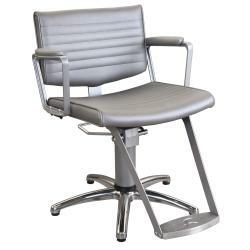 This styling chair features heavy duty, fabricated tubular steel arms that wrap around the back of the chair. The contemporary style, custom upholstery, the tubular steel Colllins symbol footrest and powder-coated steel give Quarta an unique design. It is one of Collins? top 3 fan-favorite chairs. The Quarta looks best on the optional 20-20 Square Hydraulic Base. Available in uphostery colors. 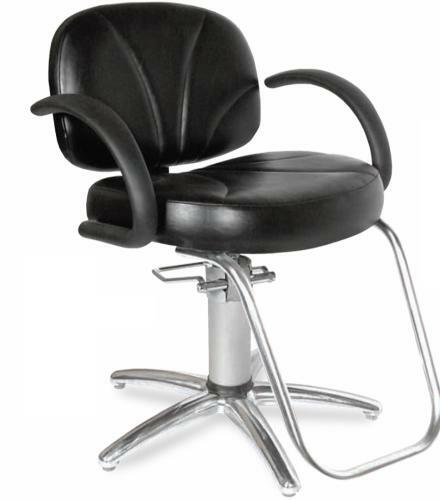 The 6700V styling chair offers the highest level of quality and durability that you can find. 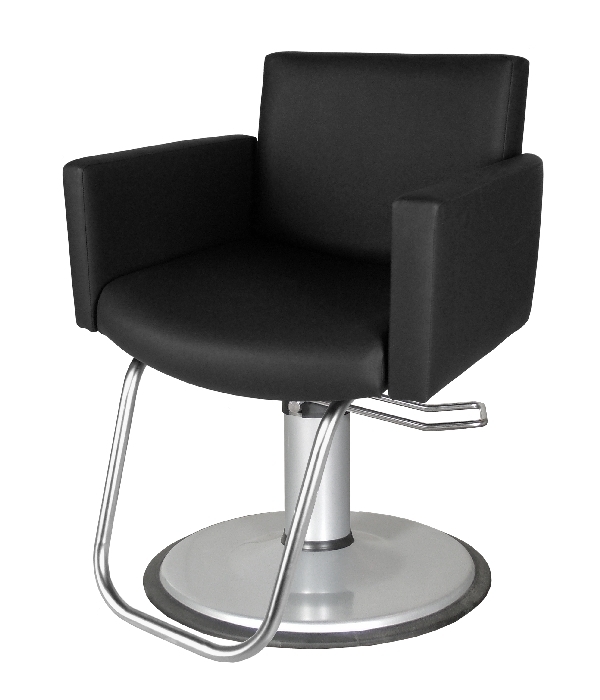 This styling chair features heavy duty, fabricated tubular steel arms that wrap around the back of the chair. The contemporary style, custom upholstery, the tubular steel Colllins symbol footrest and powder-coated steel give Quarta an unique design. It is one of Collins? top 3 fan-favorite chairs. The Quarta looks best on the optional 20-20 Square Hydraulic Base. Available in uphostery colors. 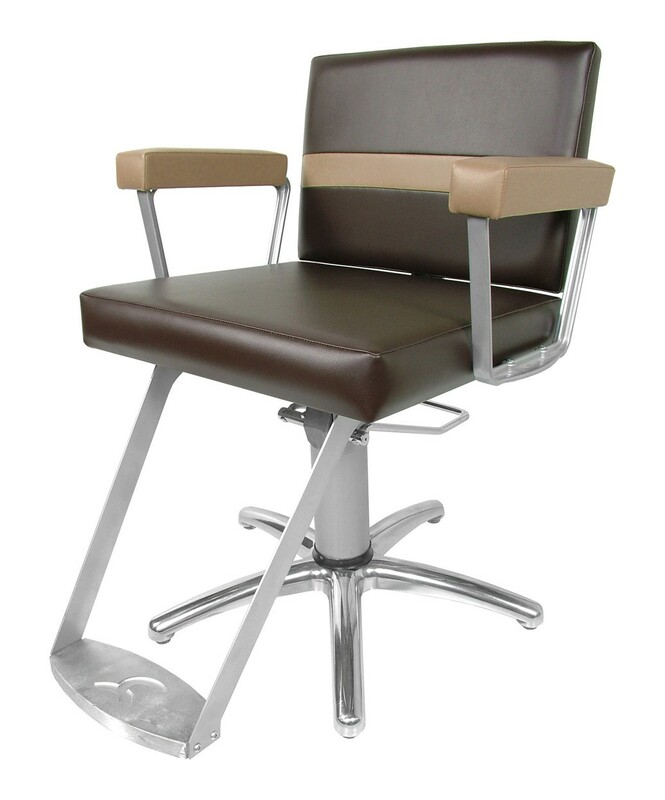 The 6700S styling chair offers the highest level of quality and durability that you can find. 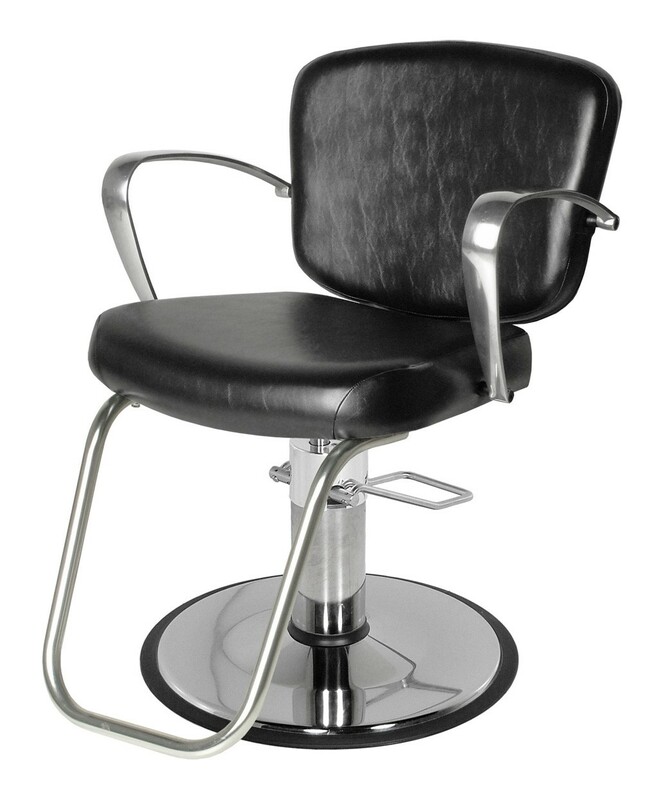 This styling chair features heavy duty, fabricated tubular steel arms that wrap around the back of the chair. The contemporary style, custom upholstery, the tubular steel Colllins symbol footrest and powder-coated steel give Quarta an unique design. It is one of Collins? top 3 fan-favorite chairs. The Quarta looks best on the optional 20-20 Square Hydraulic Base. Available in uphostery colors. 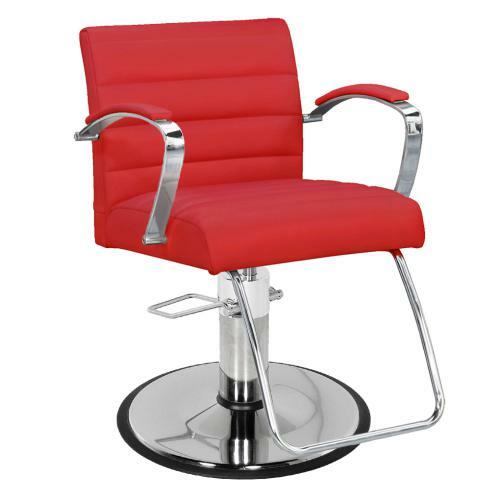 The 6700X styling chair offers the highest level of quality and durability that you can find. 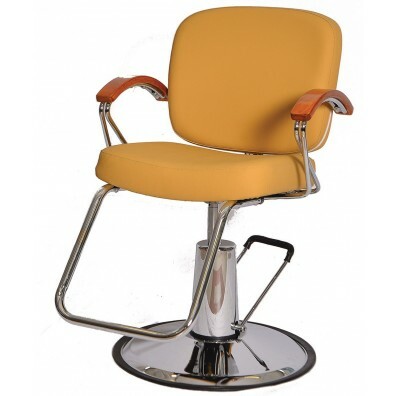 This styling chair features heavy duty, fabricated tubular steel arms that wrap around the back of the chair. The contemporary style, custom upholstery, the tubular steel Colllins symbol footrest and powder-coated steel give Quarta an unique design. It is one of Collins? top 3 fan-favorite chairs. The Quarta looks best on the optional 20-20 Square Hydraulic Base. Available in uphostery colors. 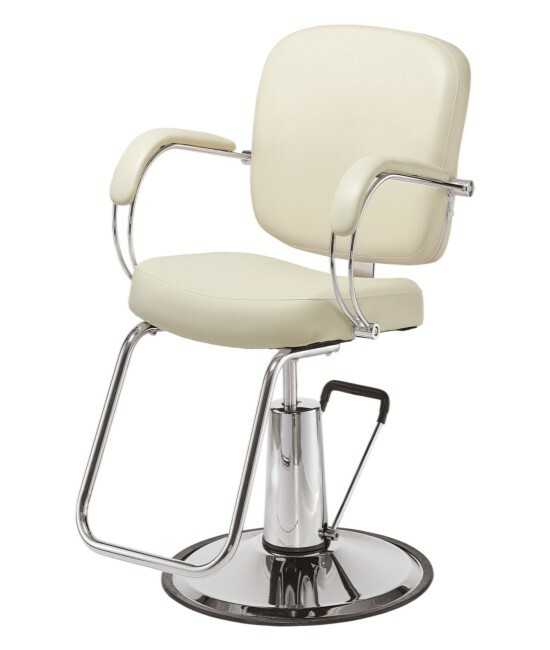 The Nouveau styling chair features premium quilted upholstery, a deluxe footrest and an American-Made hydraulic system. It also features a half an inch gap all around the seat cushion which creates a place for hair to escape. 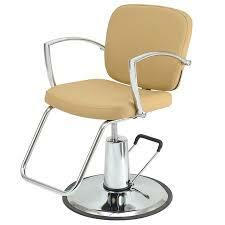 The Nouveau styling chair is available in vinyl colors as well as other options for the hydraulic base. Here is shown with 20-20 square base. 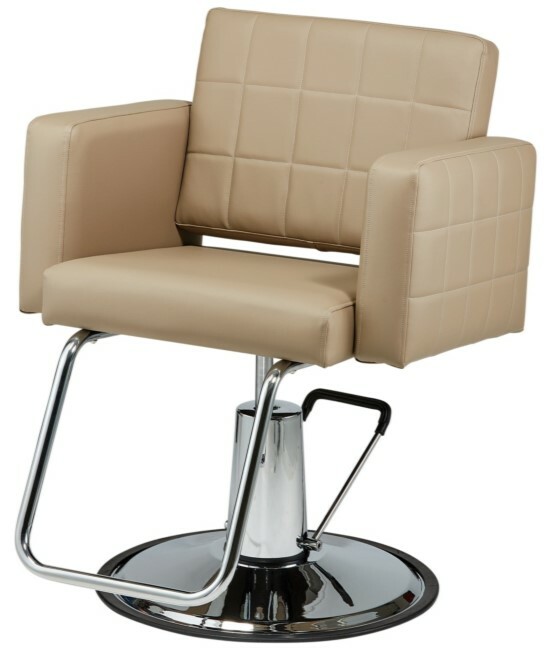 The Nouveau styling chair features premium quilted upholstery, a deluxe footrest and an American-Made hydraulic system. It also features a half an inch gap all around the seat cushion which creates a place for hair to escape. 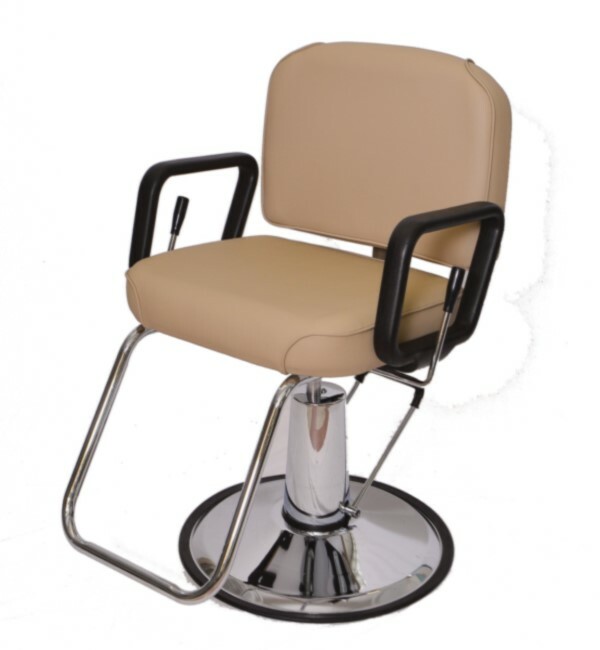 The Nouveau styling chair is available in vinyl colors as well as other options for the hydraulic base. The Nouveau reception chair features premium quilted upholstery for elegace and comfort. It also features a half an inch gap all around the seat cushion which creates a place for hair to escape and modern steel legs. The Nouveau reception chair is available in vinyl colors. This styling chair features plush cushioning, padded armrests and a classic button-tuft look on the back cushion. 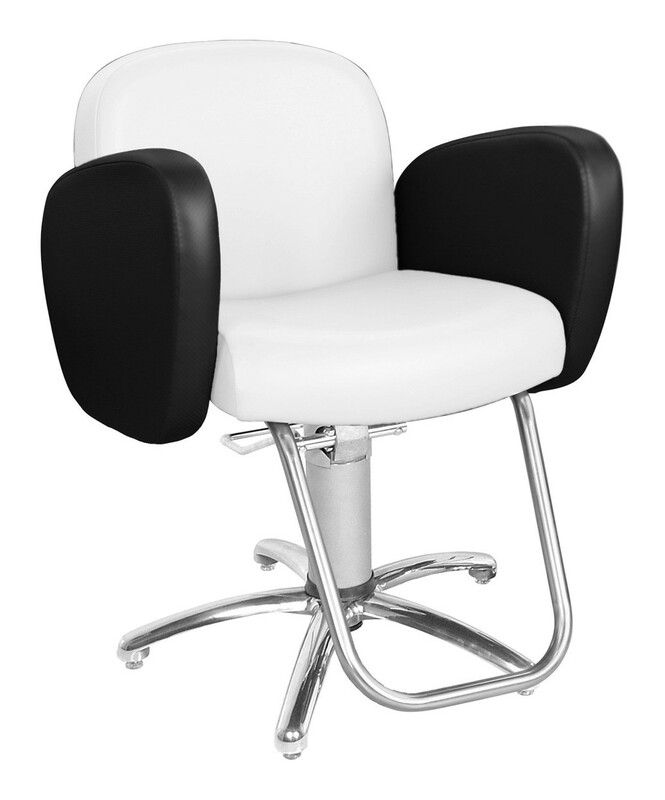 The customizable features make this chair great for a new salon, as well as an existing one. This distinctive chair is accommodating by measuring an extra-wide 22? between the arms for your client's comfort. Available in vinyl colors. 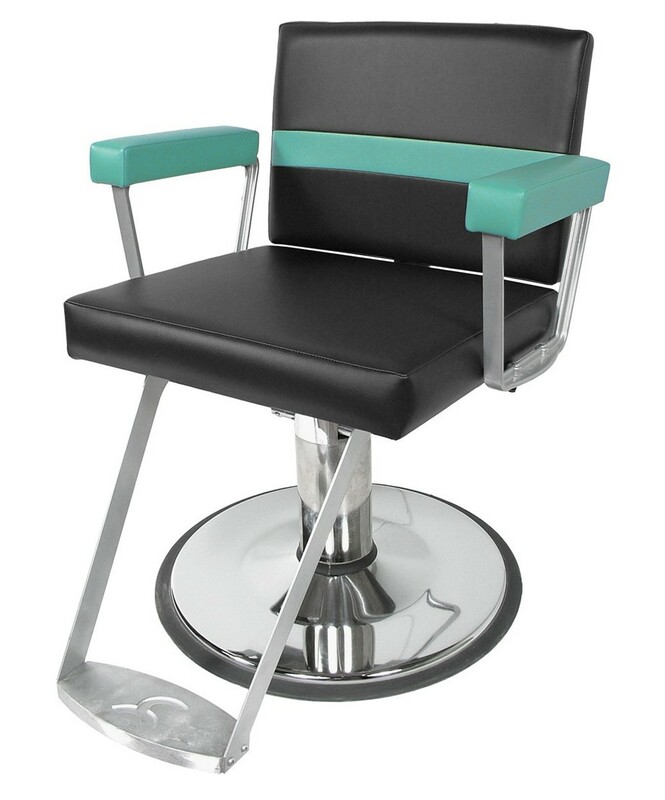 The clean modern lines of the Aluma styling chair gives it a look that sets it apart from the rest. It features a comfortably contoured seat and back, premium quilted stitching, solid cast-aluminum arms and a laser-steel footrest. Available in upholstery colors. 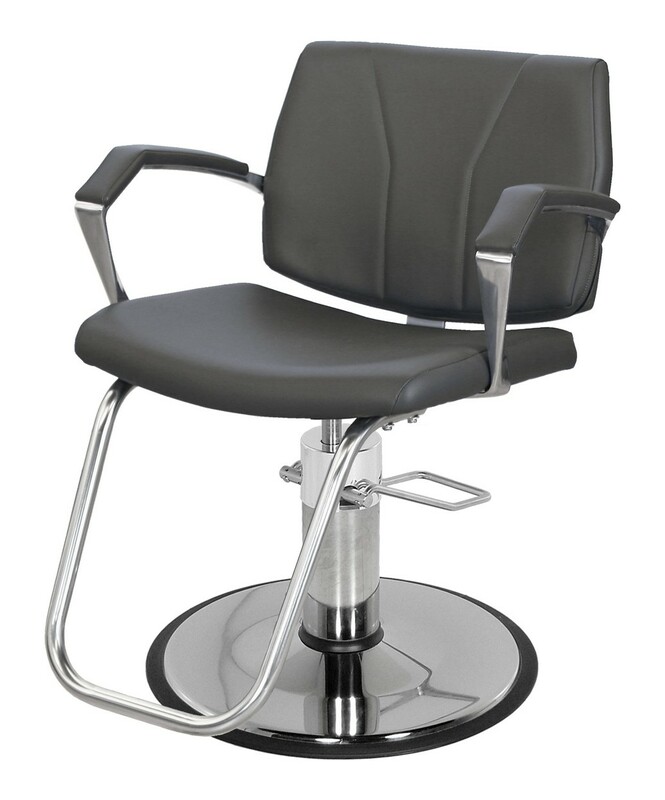 The Collins 1800 QSE styling chair offers superior unmatched quality! It has padded and upholstered seat and back cushions, black urethane armrests and a U-bar style foot rest. Available in QSE upholstery colors. Made in America. Built and shipped in 2 weeks. 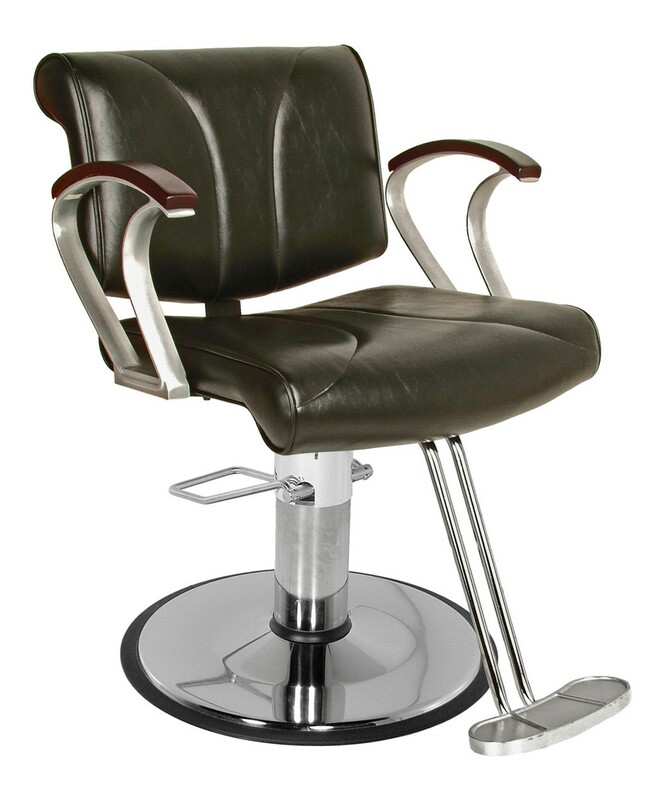 The Collins 1800S QSE styling chair offers superior unmatched quality! 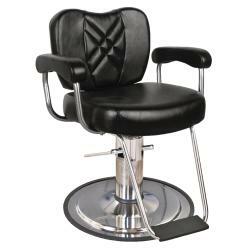 It has padded and upholstered seat and back cushions, black urethane armrests,a U-bar style foot rest and a slim-star hydraulic base making ease to move it around the salon. Available in QSE upholstery colors. Made in America. Built and shipped in 2 weeks. 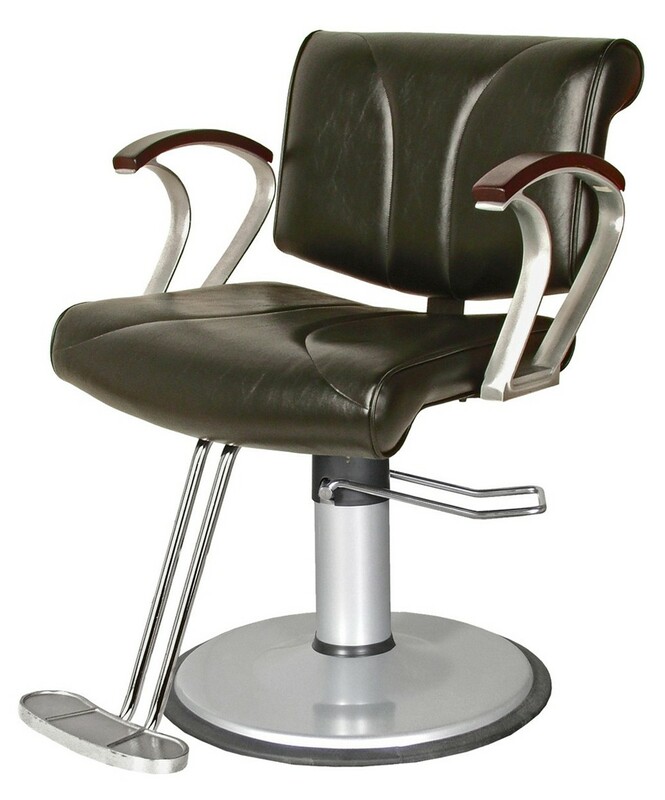 The Collins 1800V QSE styling chair offers superior unmatched quality! It has padded and upholstered seat and back cushions, black urethane armrests and a U-bar style foot rest. Available in QSE upholstery colors. Made in America. Built and shipped in 2 weeks. 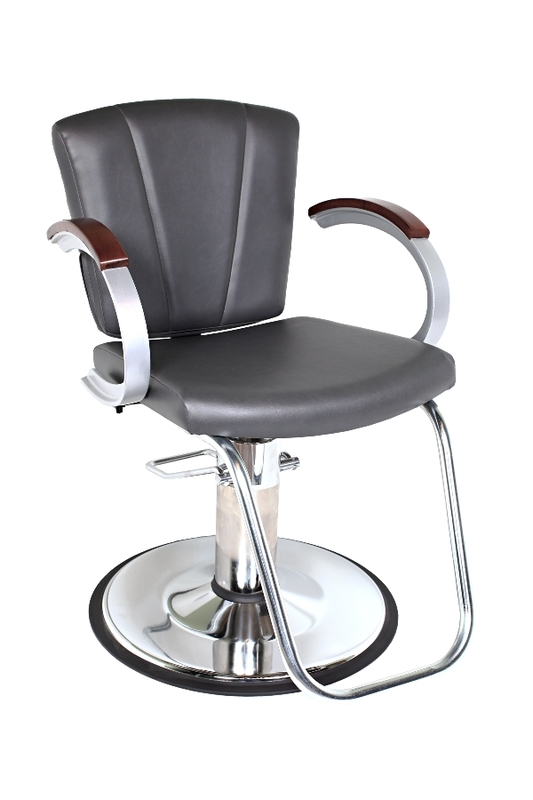 The Kiva styling chair offers superior and unmatched quality. This styling chair will match any salon d?cor. It will make your guests comfort with a padded and upholstered back and seat cushion and black molded armrests. 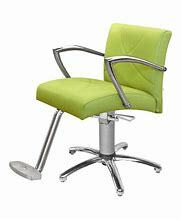 This chair comes with a standard U-bar footrest and sleek chrome hydraulic base. Available in QSE upholstery colors. Made in America. Built and shipped in 2 weeks. 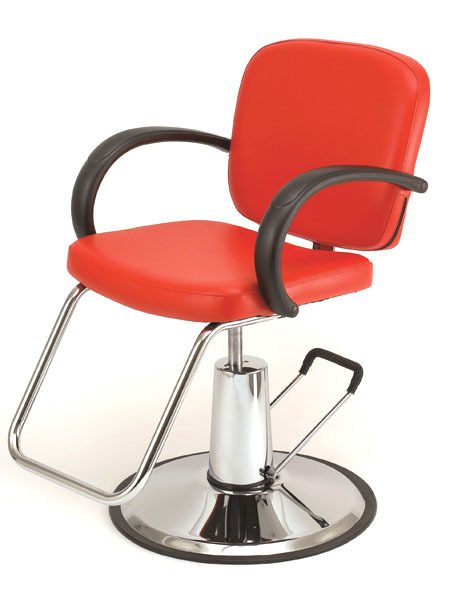 The Kiva styling chair offers superior and unmatched quality. This styling chair will match any salon d?cor. It will make your guests comfort with a padded and upholstered back and seat cushion and black molded armrests. 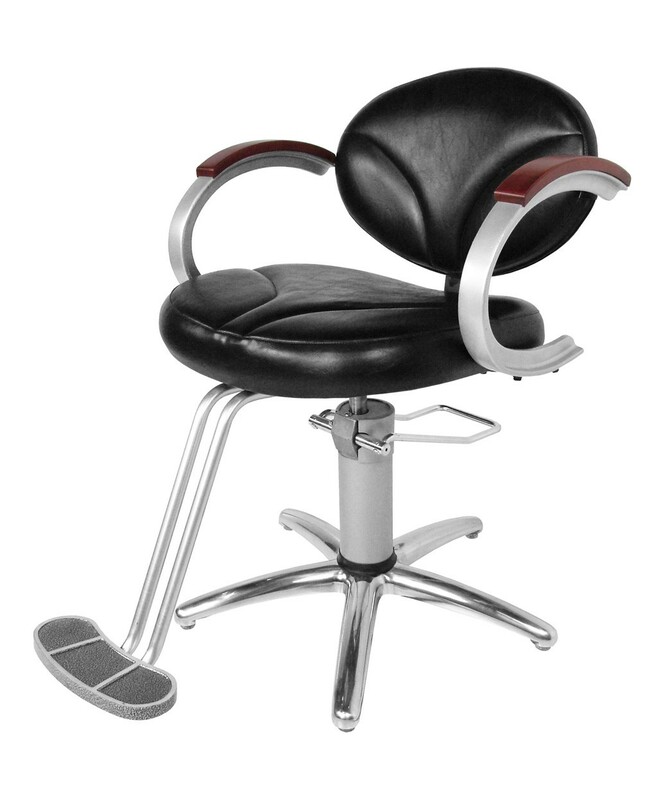 This chair comes with a standard U-bar footrest and a slim-star hydraulic base making ease to move it around the salon base. Available in QSE upholstery colors. Made in America. Built and shipped in 2 weeks. 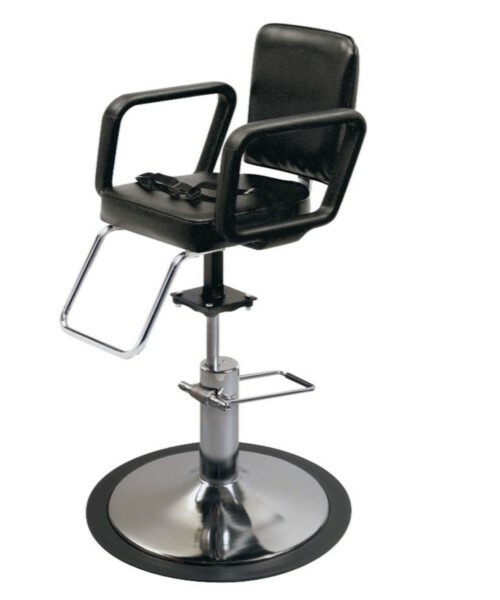 The Vanelle Styling Chair by Collins is made 100% in the U.S.A and features Collins' industry best 7.5 year warranty on the hydraulic pump. The Vanelle Chair features metallic silver epoxy coated cast-aluminum arms and solid wood arm rests in cherry or maple (also available in black urethane). This chair features premium quilted upholstery with a ?V? Shape on the Back Cushion. . Available in QSE upholstery colors. Made in America. Built and shipped in 2 weeks. 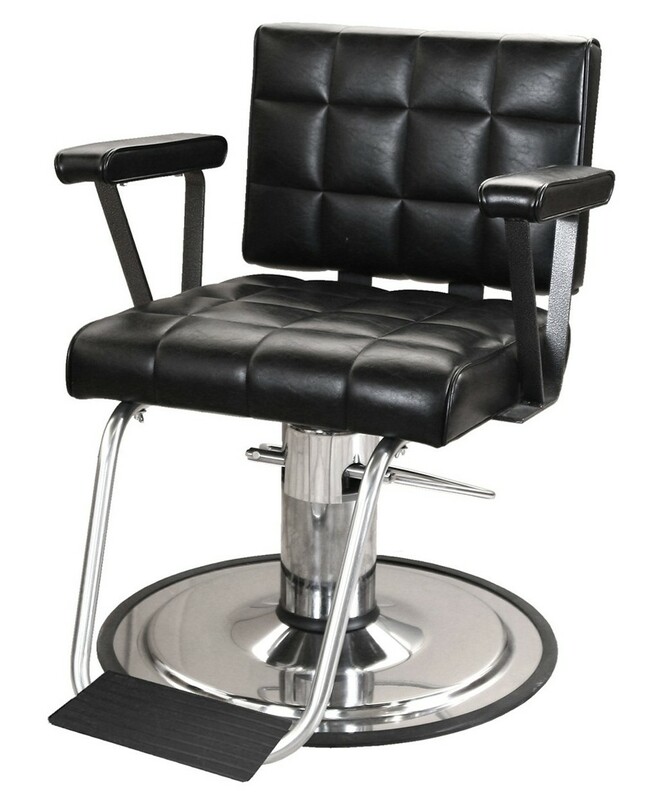 The Fusion styling chair offers superior and unmatched quality. This styling chair will match any salon d?cor. It will make your guests comfort with a padded and upholstered back and seat cushion and padded armrests. 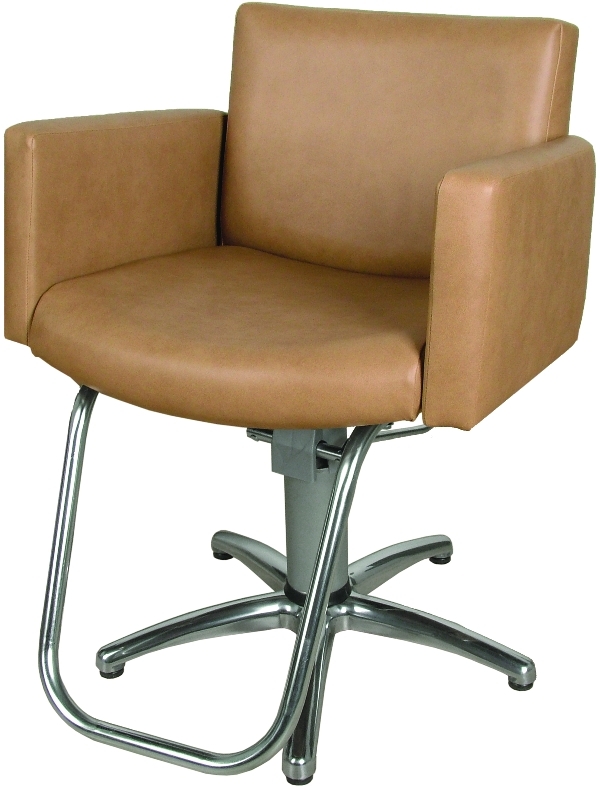 This chair comes with a standard U-bar footrest and a standard hydraulic base. Available in upholstery colors. Made in America. 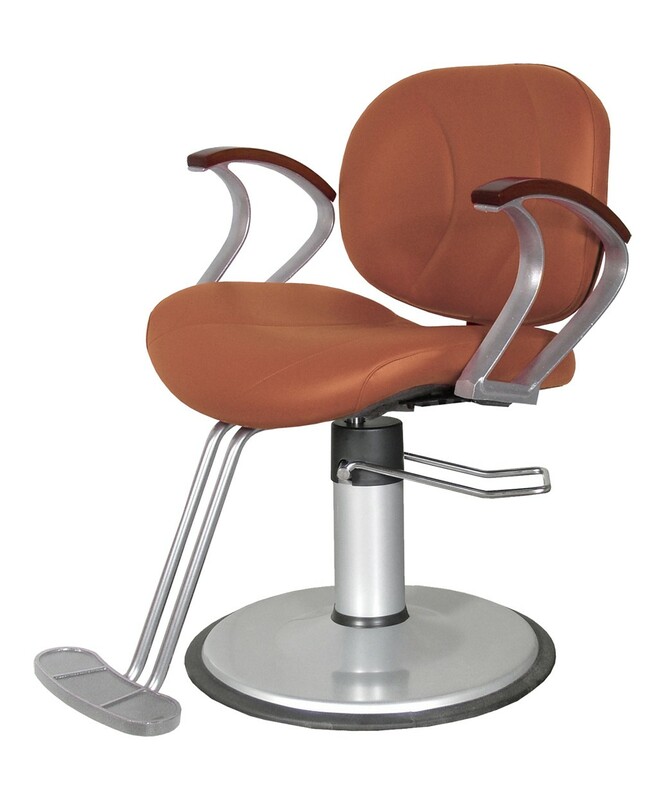 The Fusion styling chair offers superior and unmatched quality. This styling chair will match any salon d?cor. It will make your guests comfort with a padded and upholstered back and seat cushion and padded armrests. This chair comes with a standard U-bar footrest and a slim-star hydraulic base. Available in upholstery colors. Made in America. 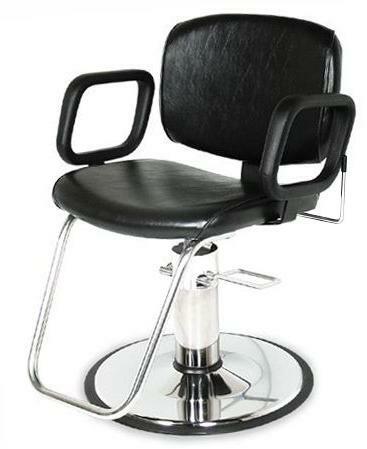 The Fusion styling chair offers superior and unmatched quality. This styling chair will match any salon d?cor. It will make your guests comfort with a padded and upholstered back and seat cushion and padded armrests. 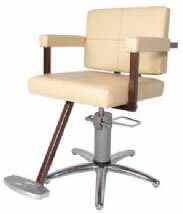 This chair comes with a standard U-bar footrest and an enviro hydraulic base. Available in upholstery colors. Made in America. 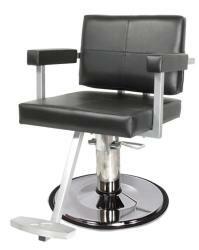 The Fusion styling chair offers superior and unmatched quality. 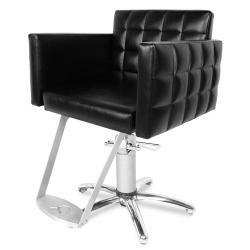 This styling chair will match any salon d?cor. It will make your guests comfort with a padded and upholstered back and seat cushion and padded armrests. 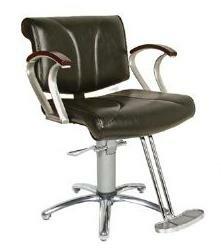 This chair comes with a standard U-bar footrest and an square hydraulic base. Available in upholstery colors. Made in America. 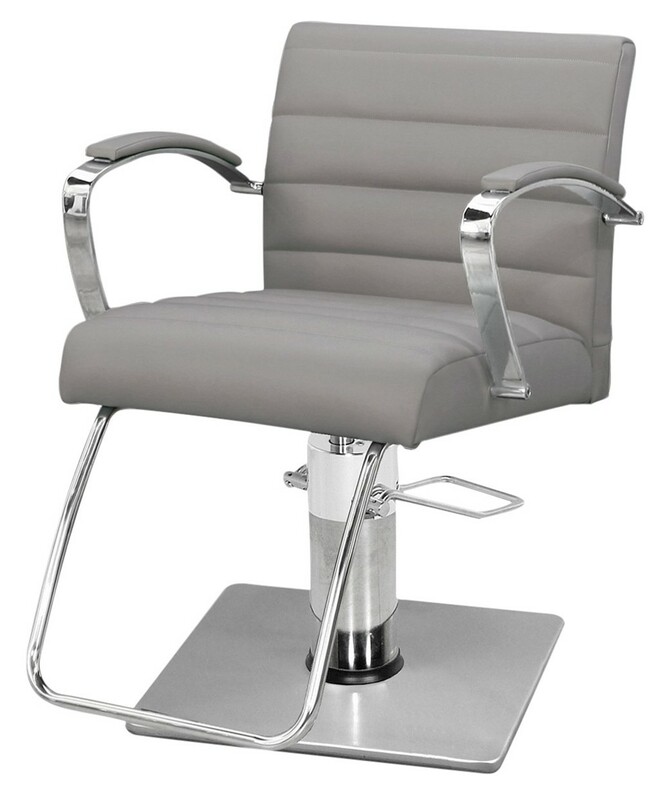 The Bella styling chair offers superior and unmatched quality. This styling chair has a feminine, petite look and feel. It is comfortable and accommodating with a generous 22? between the arms. It will make your guests comfort with a padded and upholstered back and seat cushion and tasteful steel armrests. 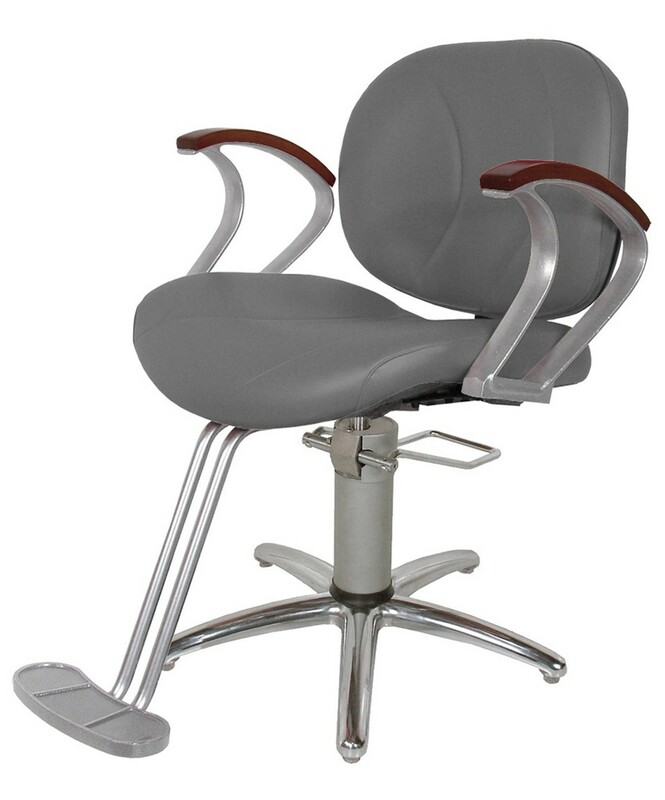 This chair comes with a standard U-bar footrest and a standard hydraulic base. Available in upholstery colors. Made in America. 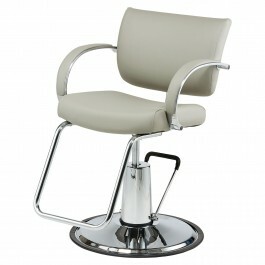 The Bella styling chair offers superior and unmatched quality. This styling chair has a feminine, petite look and feel. It is comfortable and accommodating with a generous 22? between the arms. It will make your guests comfort with a padded and upholstered back and seat cushion and tasteful steel armrests. This chair comes with a standard U-bar footrest and a slim-star hydraulic base. Available in upholstery colors. Made in America. 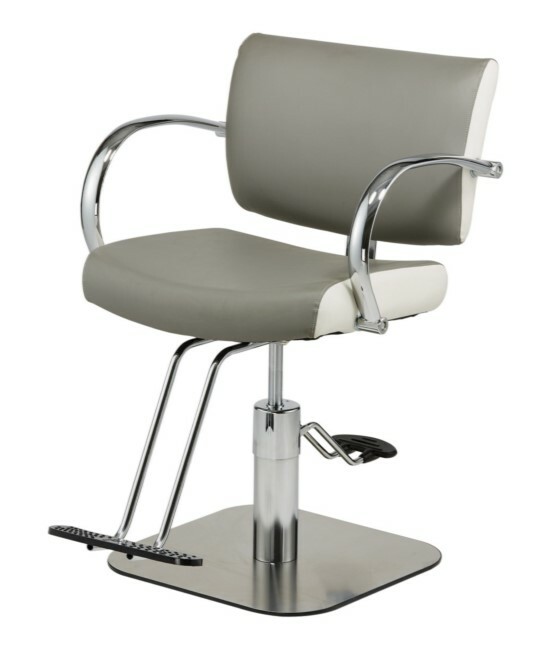 The Bella styling chair offers superior and unmatched quality. This styling chair has a feminine, petite look and feel. It is comfortable and accommodating with a generous 22? between the arms. It will make your guests comfort with a padded and upholstered back and seat cushion and tasteful steel armrests. 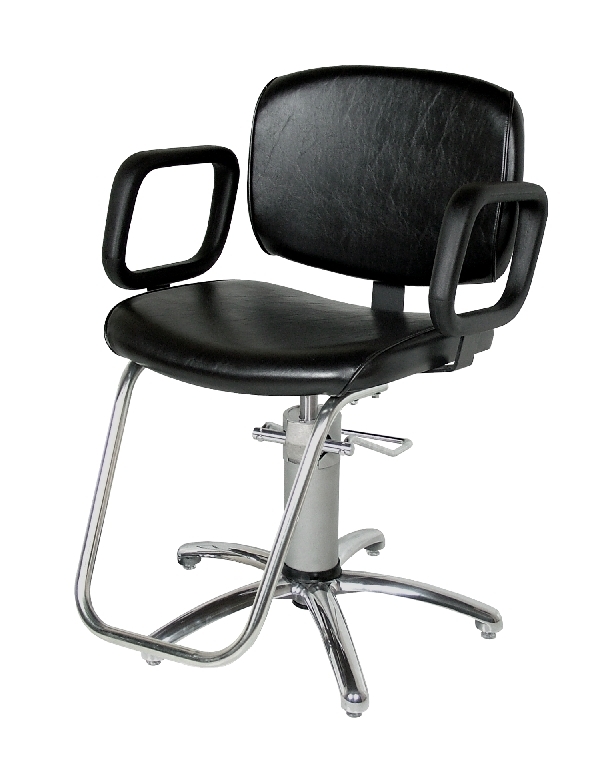 This chair comes with a standard U-bar footrest and an enviro hydraulic base. Available in upholstery colors. Made in America. 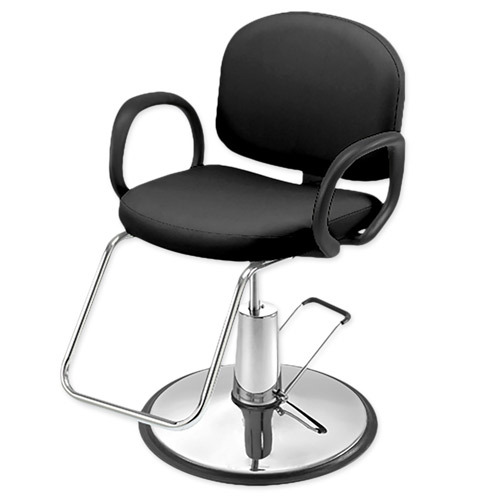 The Silhouette styling chair offers superior and unmatched quality. This chair has been beautifully tailored with cast aluminum alloy arms with real wood armpads which can be ordered in maple, cherry, cafelle or mahogany. It also features the ?easy step? T-Bar footrest with a cast aluminum tread plate, whose soft curves protect the shins and ankles. Available in upholstery colors. Made in America. The Maxi styling chair is a heavily padded, oversized heavy duty chair with telescoping arms. The chair measures 23 inches between the arms and the arms on the chair can be adjusted outward another 3? for a wide 26? between the arms. This unique chair permits to comfortably accommodate larger customers that most chairs cannot handle. It comes with heavy duty hydraulic pump and an over sized 26? diameter base plate. Available in upholstery colors. 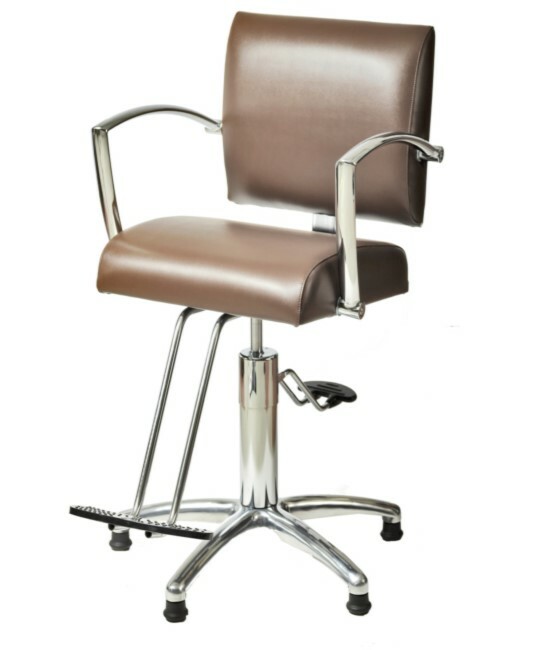 The Chelsea styling chair offers superior and unmatched quality. 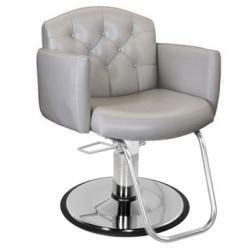 It has stylish, plush and comfortable features, this chair style has been specified for new salon projects by some of the top salon designers. 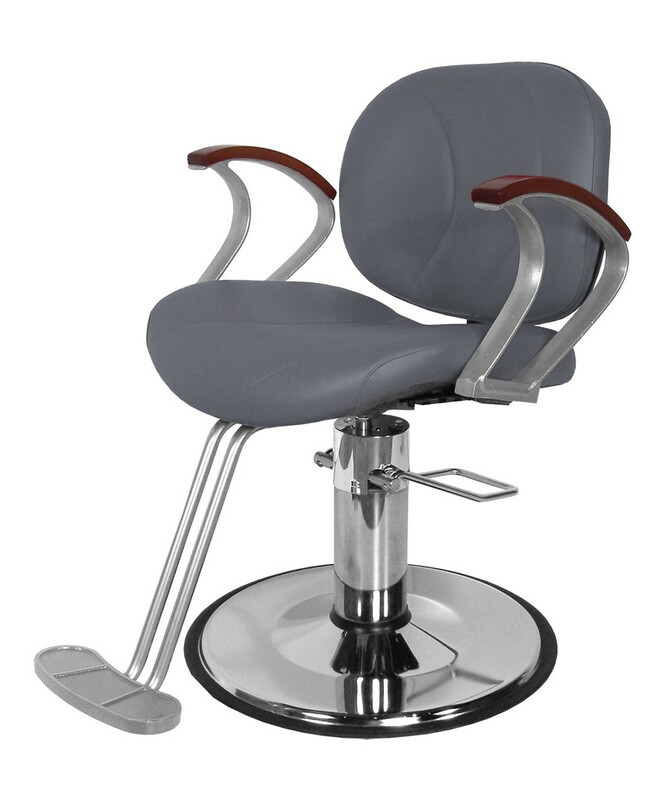 The Chelsea styling chair features powder coated cast-aluminum arms with real wood armpads, expert quilted upholstery and a premium t-bar footrest. Available in upholstery colors. 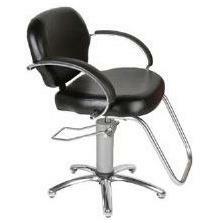 The Callie styling chair offers the best design and quality that you can find in the salon equipment industry. The square cushions, angled arms and complimentary upholstery pattern makes the new Callie Chair a standout! The shapes and curves of this chair look great. Available in upholstery colors. 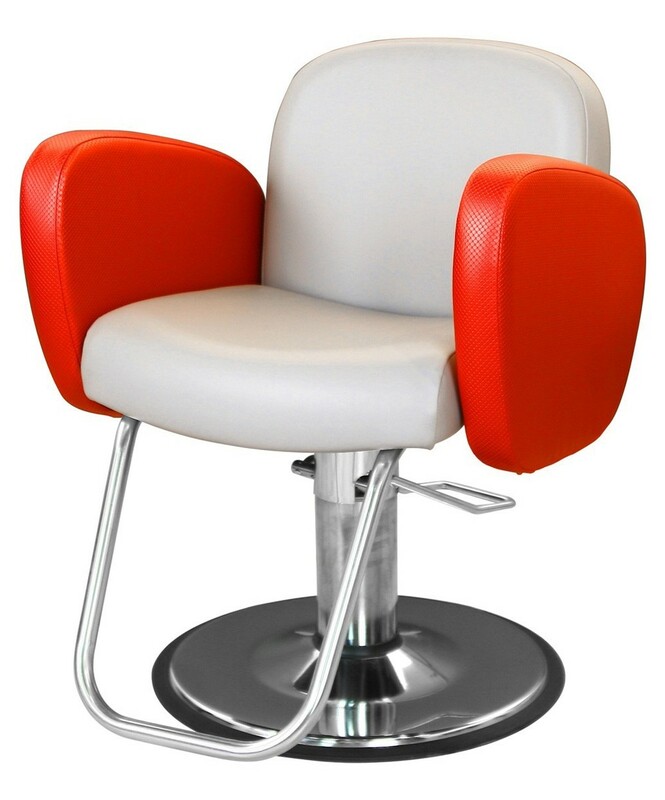 The Phenix styling chair offers the best design and quality that you can find in the salon equipment industry. The Phenix is a combination of interesting design lines, custom upholstery and all-new polished aluminum arms with padded upholstered arm rests. It accommodates a wide range of customers with 22? between the arms. Available in upholstery colors. 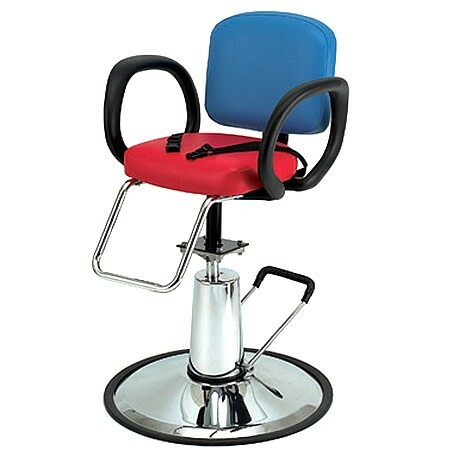 The Taress styling chair offers the best design and quality that you can find in the salon equipment industry. This chair grouping combines fashioned angles, fashioned accents and fashioned comfort. The Taress features the laser steel footrest with the Collins signature symbol as well as the ability to incorporate any two Collins colors into the design. The Tarress also looks great in solid colors without the contrasting accent color or with just the back accented and the arms in the main color. Available in upholstery colors. 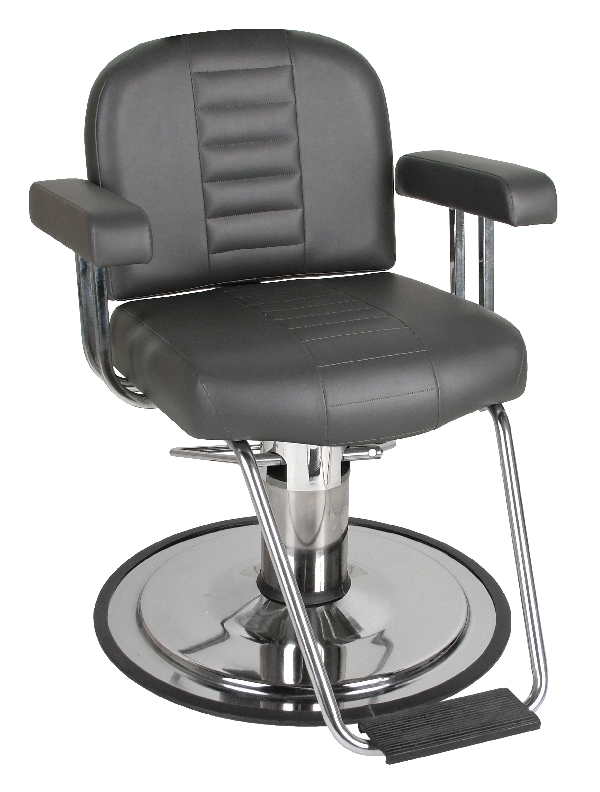 The Belize styling chair offers the best design and quality that you can find in the salon equipment industry. This features a compound curved seat and back, custom stitched upholstery, cast aluminum arms in black or metallic silver, real wood arm pads in maple, cherry or mahogany and available in black urethane and the deluxe t-bar footrest. 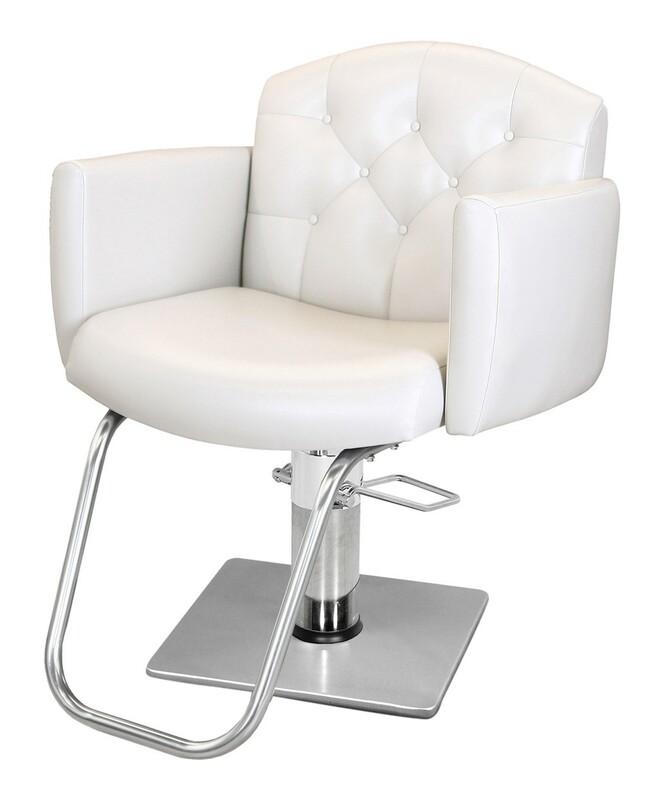 The Belize Chair is an upscale chair for an upscale salon. Available in uphosltery colors. 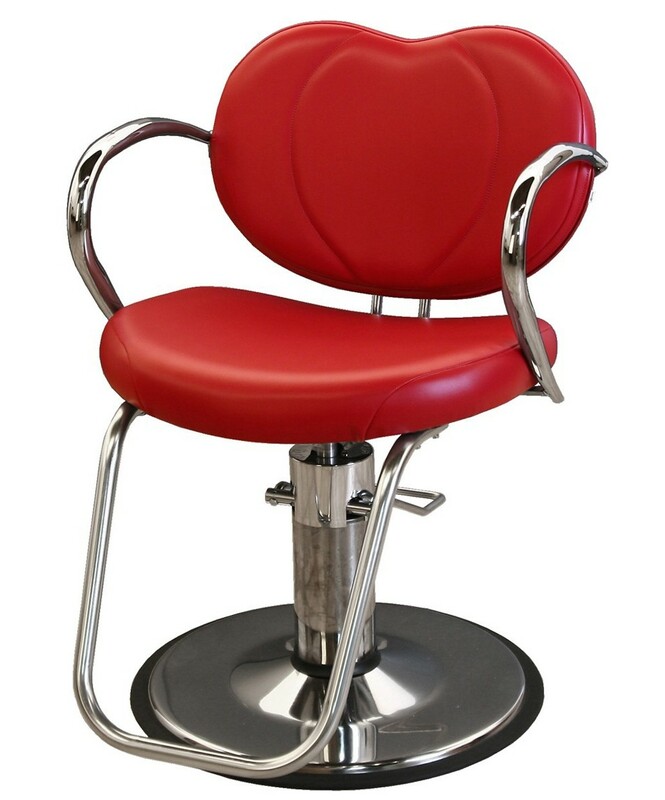 The Cirrus styling chair is the perfect blend of style, comfort and durability. It has commercial quality expanded vinyl, double stitched seams with nylon thread on thick, comfortably padded cushions. 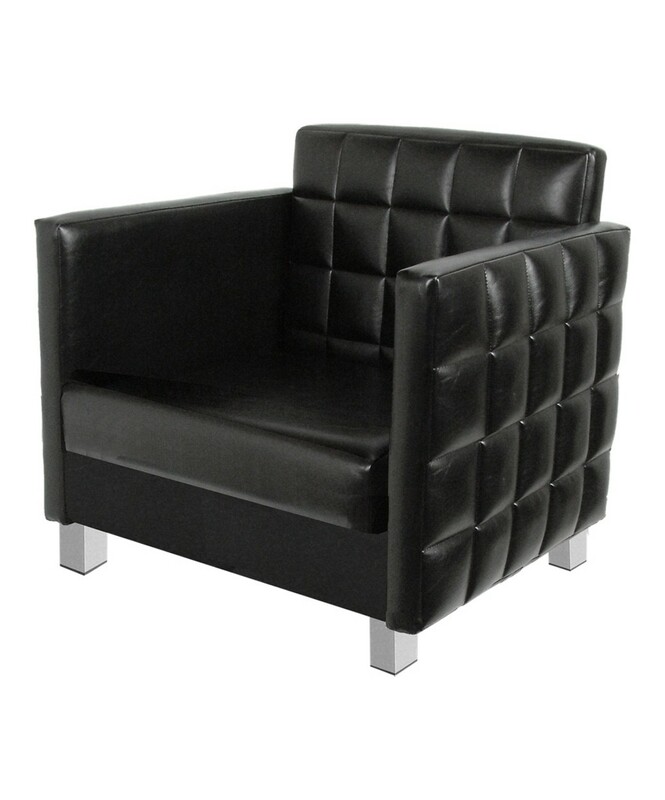 This chair features molded black urethane arm pads on top of chrome metal armrests. It also has 350 lbs lifting capacity. Available in uphosltery colors. 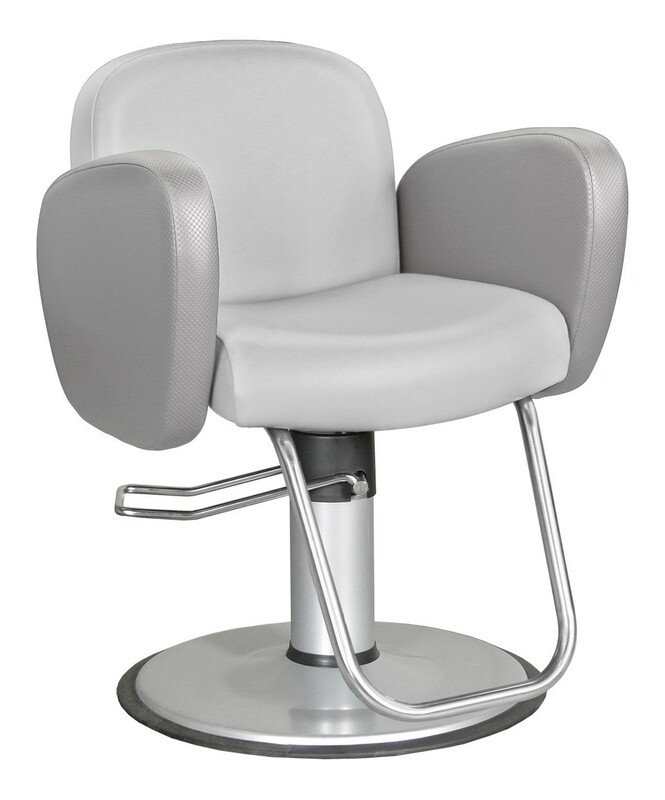 The ATL styling chair great shapes, the plush feel and the unique look will set your salon apart from the rest! It features the ability to incorporate any two Collins colors into the design by special request, U-bar footrest, padded and upholstered seat, back and arms. The ATL also looks great in solid colors without any contrasting accent colors for the arms. Available in uphosltery colors. 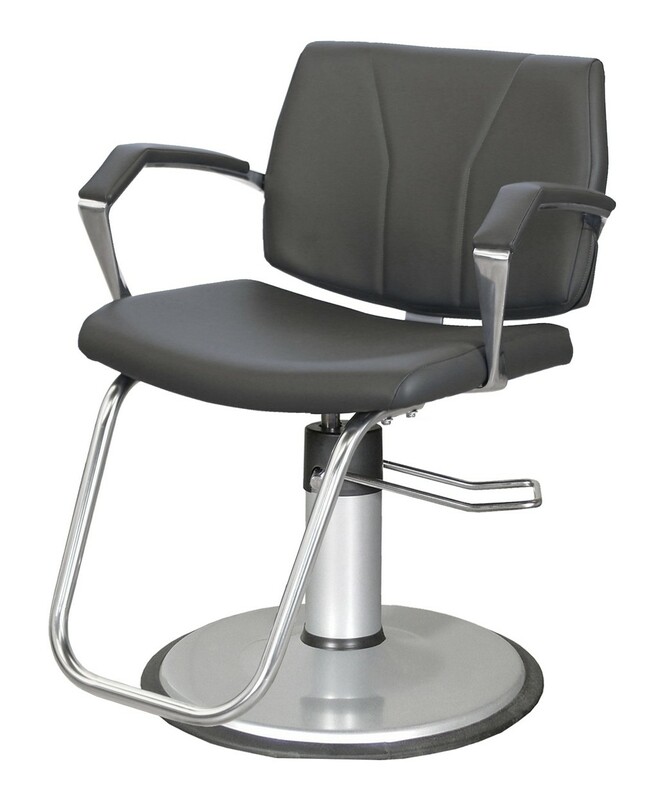 The Milano styling chair offers the best design and quality that you can find in the salon equipment industry. 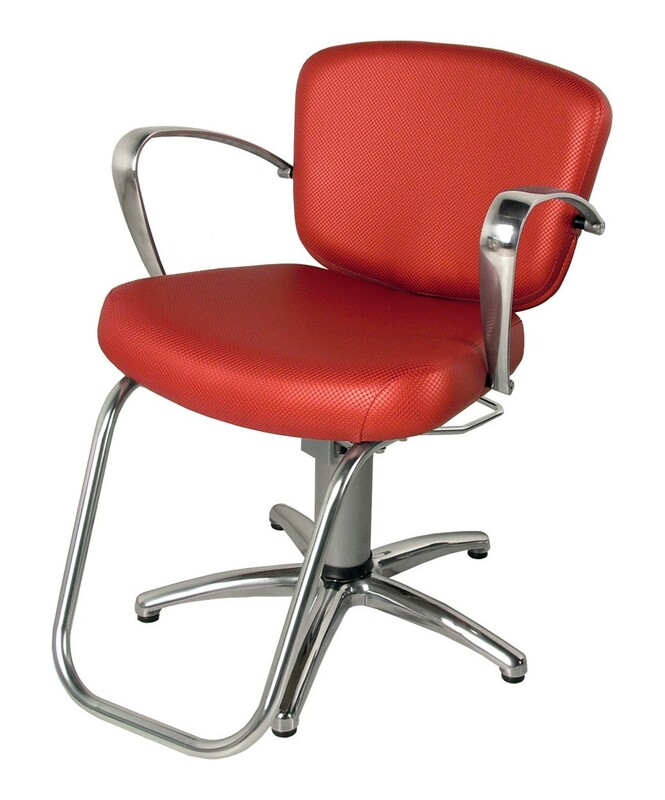 It offers clean soft lines, comfortable seating and modern polished cast-aluminum arms. The simplicity of this chair allows it to look great in multiple decors. 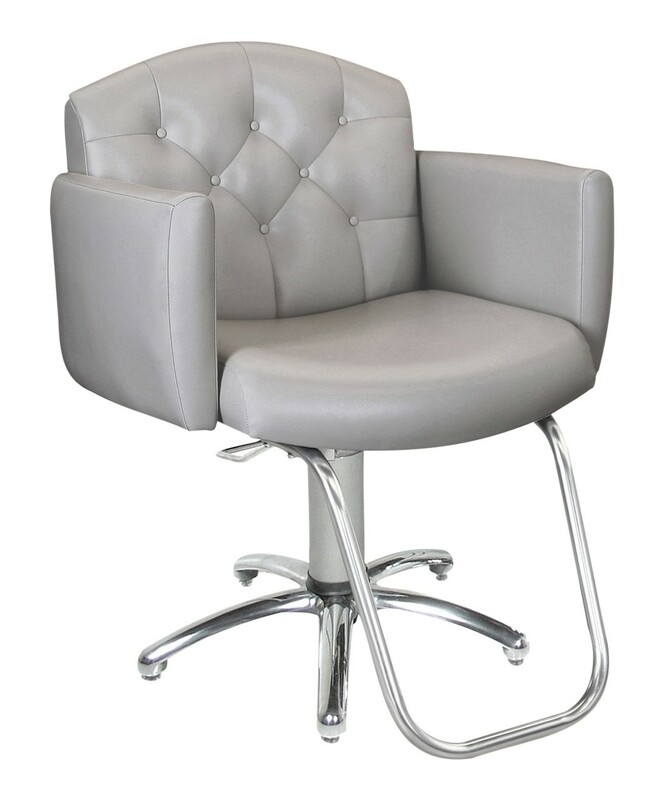 It features polished cast aluminum arms, U-bar footrest and padded and upholstered seat and back. Available in upholstery colors. 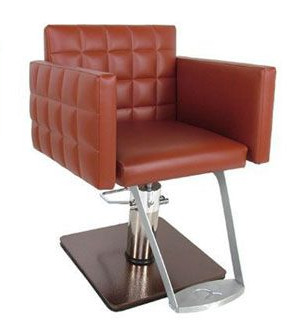 The Le Fleur styling chair is the perfect blend of style, comfort and durability. It features premium quilted upholstery in an open flower stitched pattern with sleek, durable urethane arms, padded and upholstered back and seat and U-bar footrest. Available in upholstery colors.